So, the question is: DIY (Do It Yourself) or hire a pro? It is time to decide as far as DIY projects are highly popular. People try to make their own mistakes. That’s good but not about such serious and responsible task as constructing a floor. How to decide on the right installation for your project? You have that great new floor picked out. You are wondering: should I tackle the installation myself or hire professional flooring contractor? Here are 4 more questions to ask yourself before you decide which way to go. They are helpful if you can answer them honestly. Successful DIY projects give you satisfaction and bragging rights. And, of course, they can help you save money by doing the work yourself. For small flooring projects like bathrooms or laundry rooms, DIY may be the right way to go, especially if you have a little experience in floor constructing. Nevertheless, for many flooring installations, the best advice is calling professional flooring contractors, the best in your region. What is your real DIY experience level? If you are a professional DIYer, then you are probably already familiar with basic tools, materials and how to use them. That is a good start for a new flooring installation. But even experienced DIYers can run into stumbling blocks that test their skills, and eat up time and money. It can be helpful to review your skills, because the result of your work much depends on the floor type. So, how can you honestly call your experience in floor constructing, Beginner or Advanced? Is your flooring installation project easy to do or not really? What makes the process of floor installation difficult? If you have a large room with architectural features, tricky cuts, uneven subfloors, unusually shaped rooms, patterning, you cannot use your DIY skills. These kinds of installation challenges are best left to the efficient skills of a pro flooring contractor. They know the tips and tricks to get the job done quickly with professional-looking results. Their work is fast and always professional. Do you need peace of mind and patience? A proper installation is critical to creating the look you want and making sure it stays that way for years to come. Certified flooring contractors as Quality Floors 4 Less and other similar to them has already proven their expertise. They have undergone a series of hands-on tests and written exams to prove their knowledge and skills. They always care of what they do and insured all possible work-related damages. Are you free in time to do the installation yourself? The time involved with researching flooring options, shopping and physical labor can add up fast. If you prefer to minimize disruption to your home and lifestyle, hire professional flooring contractor. They will take all possible steps to ensure the installation goes as smoothly as possible, so you can start enjoying your new floor without delay. They’ll also walk you through the maintenance requirements after installation. Installation of wood floors comes with lots of tough choices to make. Today, there are several wood flooring options available on the market compared to previous years and the number can be mind boggling. To have the process of installation successfully done, you have to consider lots of crucial facts. Wood Flooring Specialists will help the house owner make sense of all the choices available in the market to ensure he or she comes up with the best plan that will suit his or her needs. When you contract a reputable wood floor installation contractor to get the job done, be sure of getting durable results since proper wood floor installation is important in helping you get the most out of your floors. These specialists will ensure they use their experience to deliver a sturdy, smooth and safe wood installation. Only the properly installed wood floors will be capable of adding style and charm to your room, increasing the value and overall appearance of your house. You should always look to hire professional flooring contractor to handle this type of job as floor constructing process brookes no contradictions. It is not a secret that professional work is better than amateur attempts. It does not matter what type of flooring you need to install. Any flooring installation will always take time. Most of the professional contractors are known to have years of experience they can use to ensure wood floor installation is done quickly and effectively. Have you ever thought what you will do with the old floor once you have installed your new floor? 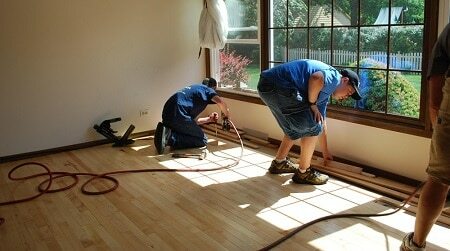 Most of the unprofessional wood flooring installers will never help in the cleanup aspect of the project. However, your professional wood flooring contractor will not only ensure they have correctly installed a high quality floor but will also help in disposing the old floor and waste materials with ease. It is hard for the inexperienced and unprofessional floor installers to install a wood floor perfectly and apply the finish evenly. Most house rooms are not evenly shaped making it difficult for the inexperienced floor installers to correctly do wood flooring. However, the professional flooring contractor have got the skills and experience to help navigate the tough areas and angles and have the right tools that will ensure perfect installation of wood floors. What is more, never forget about professional materials that you cannot get from the store if you are not a professional. You cannot even name what is what! The overall feel and look of your wood floors will depend on the type of wood you choose. 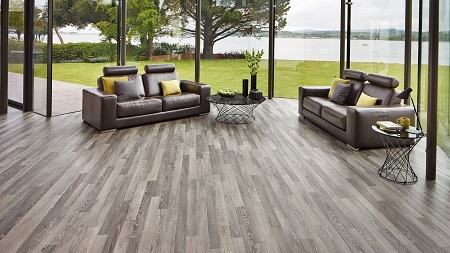 It will be not bad to have a professional look even when you are choosing the type of floor. It is not only about the floor color, right? So, choosing a low quality wood will result in issues such as warps, splinters, fade, within a short period after installation. However, with the help of professional flooring contractors, you can select the best wood for your house floor based on factors such as environmental conditions and climate. When you hire professional flooring contractor, it will help in providing great results whether you are in need of a completely new flooring installation or a wood flooring repair. Why Choose Reno Hardwood, Engineered & Laminate Flooring Certified Installer? There was a lot to be said for the confidence gained after a successful DIY project. But some flooring installations are just not as easy as you might think. When in doubt, it is better to hire professional flooring contractor instead of doing it yourself. Again, it is also important to hire the flooring company that attracts you not only in pricing but work quality. Reno Hardwood Store is the best in your region. Trust them and your installation will be done efficiently and correctly, start to finish, by a knowledgeable and experienced professional – giving you the freedom to relax and enjoy your beautiful new floor for years to come.